The Trust Board was invited to put a team of four into the Wycombe Wanderers Ex-Players Association (“WWEPA”) Annual Golf Day held on Friday 21st July at Winter Hill Golf Club. 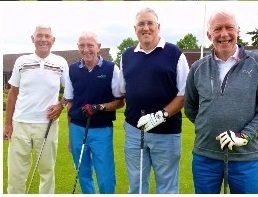 The challenge was taken up by David Roberton, Nigel Kingston, Alan Cecil and David Cook pictured (l-r) on the first tee. Whilst they didn’t win any prizes, our team scored a credible 81 team points (best 2 out of 4 on each hole) and all enjoyed themselves in the process, paying their own way for the whole day. At the evening dinner there was a fundraising raffle and an auction for two hospitality tickets (donated by Andy Harman) to the ATP Tennis Championship at the O2 Arena in November , with the proceeds going towards the WWEPA’s stated Charity which is the Willow Foundation – set up by former Arsenal legend Bob Wilson and his wife in memory of their daughter.